Teachers in NSW public schools are invited to add a profile of themselves and share online resources with other teachers in a new wiki, NSW DET Staff 2.0 created by Sydney Region’s Stu Hasic. What a great way for NSW teachers to find each other, network and share expertise. I love the way that you can search the wiki for the tool you are trying to use (e.g. 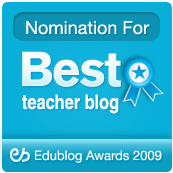 edublogs, ning, twitter) and find like-minded professionals who have used it before. Networks like these are becoming increasingly important as we learn new pedagogies required to bring on the Digital Education Revolution in our classrooms. Thanks for bringing us together Stu! This entry was posted on February 10, 2010, 12:02 am and is filed under online tools, technology. You can follow any responses to this entry through RSS 2.0. Both comments and pings are currently closed. I love the idea, love the action … but I also think it is worth noticing that resources that are created are may well be the property of thier employer. While I am all for sharing — and indeed I encourage teachers to take control of the digital IP they create, in spaces they control – it is also worth noting that ownership may not be as simple as it seems, as DET is fixated on walled gardens. I wonder what the policy is around this kind of thing? – Given the fixation on walled gardens, is there a risk? You know, I’m not sure. The wiki was created by someone IN the DET, for other DET teachers, but it is not a ‘DET site’, or even an initiative of the DET. Have you had any experience with the DET actually enforcing their IP ownership? I have always been mystified by this. For example, many people make $$ from textbooks and journal articles that contain work they would have developed when teaching at school. This technically is IP that belongs to the DET, but I don’t know of them ever asking for a profit share. There is only a risk if you want there to be one…. I note that there is a lot of discussion recently about IP and NSWDET but yet we are the most open state in Australia. Look at the work of all the teachers who openly share discuss & contribute, if that isn’t enough go to the Parents & Community face of TaLe, look at all the public resources and growing collection of Creative Commons Resources and our curriculum support site (complete with resources) is the top result when you google ‘curriculum’. If you think NSWDET has a glass wall go try and find what all the other states and jurisdictions and curricula bodies have produced let alone download/use there resources. If you don’t believe me I challenge you try and find a down-loadable resources created at the departmental level from each KLA and detailed description of exactly what they are doing for DER for each state. Thanks for sharing this, this is a great initiative from Stu. It allows teachers to connect with their Kin locally to enhance their PLN.